Che Robinson has been vegan since 1997 and took up running and lifting in 2002 as way to stay fit and healthy. In 2007, he was looking for some variety, watched the Austin Triathlon and was inspired by the athletes there. In 2008 he started racing triathlon, added duathlon in 2011 and marathon running in 2012. Presently Che lives, works and races around the incredible city of Austin, TX, USA. Anyone interested in what he does can follow him on Twitter or on his blog. I majored in Philosophy at University and took an ethics class that dealt with animal rights/welfare. That prompted me to go vegetarian. About a year later, I borrowed a copy of Diet For A New America by John Robbins from a friend and I decided that vegan was more consistent with my feelings about animal welfare and the environment. I went vegan in 1997 so it has been 16 years. If you looked at how I ate prior to being vegan, you would think I would be the least likely candidate to go vegetarian let alone vegan. At the time, the only veggies I ate then were carrots and potatoes and fruit was pretty much non-existent in my diet. Going vegan forced me to become a far more adventures eater and these days there isn't a vegetable I won't eat or new food I won't try. If it is vegan, I am up for giving it a shot. It is ironic that so many people think of veganism as limiting when in reality it expanded my diet greatly. Simply put it is an attempt to reduce the amount of suffering in the world through my day-to-day actions. I swim, cycle, run and do resistance training. When prepping for and during race season I will do two workouts a day. In the off-season I cut that in half and just go with one a day. I would love to get into coaching and that is a long-term goal, but for now I offer guidance to people who are new to multisport. I think the idea that vegans don't or can't get all the nutrients they needs is still persistent but has faded quickly. I find more and more that it is the idea that vegan food can't be flavorful or filling. I find the easiest way to combat that is invite people over for dinner, share recipes or recommend a good vegan restaurant. Being vegan, I make most of my meals at home so I rely less on eating out, fast foods and on convenience foods. Ultimately that helps me maintain a healthier diet. I travel a lot for work. Usually between 30%-50% of any given month will be spent on the road. That offers some challenges when it comes to eating but mostly this can be mitigated by planning ahead. On the training side, the challenges can be a little more difficult. Running is easy because it can be done just about anywhere but finding a swimming pool can be a challenge and traveling with a bike is cost prohibitive. I can do some research prior to going and find out where lap pools are and what bike rental options there are or what gyms have spin bikes but even then you still have to contend with schedules, facility fees and the unexpected - like most pools in Japan will not let you in if you have tattoos. The overall result is that workouts just get missed. In triathlon, Dave Scott was one of the first big names and is one of the legends of the sport. He was the first person to win the Ironman World Championships twice and still holds the male record of six wins. During that time that he dominated the sport, he was vegan. I think due to that triathletes tend to be a little more understanding and supportive of vegans. I am pretty lucky on this one. My wife is vegan, my sister and her husband are both vegetarians as is my stepsister. That leaves my dad and stepmother as the odd two out and they are both sensitive to vegetarian/vegan diets. I get the "where do you get your protein?" but that doesn't seem to come up as much as it used to. When it does come up, I point out that all protein comes from plants and I just chose to go straight to the source. More common now is people looking for resources for vegan recipes and for that I point them to various websites and cookbooks. First and foremost is my son, and being the best example I can be for him. 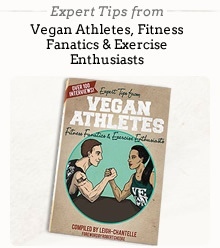 I am also inspired by vegan athletes who get out and promote veganism in a such a positive way. Dates, greens and whole grains. I use Vega and Hammer products in training. Things like gels, electrolyte tablets, and energy bars on longer rides. I also use Vega One and protein supplements particularly when traveling for more than a day or two. Gaining muscle - I hate lifting weights, but that is the key here and the heavier the better. I think more endurance athletes should be doing for injury prevention and because it has a tangible impact on performance results. Losing weight - Every year I put on some weight in the off-season and have to drop it when gearing up for the next season. The most effective method I have found is to calculate how many calories you need and eat a little under that until I hit my desired weight. To do that I figure out how many calories I need, what my macro nutrient targets should be and then start counting calories. After a few weeks of this, the good eating habits kick back in and I don't have to write down everything I eat. Maintaining weight - This one is similar to losing weight. If I start gaining weight or losing too much then I will start tracking my calorie consumption to figure out if I am under or over eating. Since overtraining can mess with water retention, I will look at that as a possible issue if my calorie count checks out. Improving metabolism - Eat more whole foods, fewer processed starches and move more. Toning up - Resistance training, good eating habits and a bit of patience. Though I have been called pretentious for saying this but I think the best way to promote veganism is by example. I also wear pro-veg gear to races. Nothing aggressive with its message but things like a "No Meat Athlete" shirt or something that says "Go Vegan". I am still surprised by the number of people that will approach me based on that alone and ask questions. Triathlon can seem a bit daunting to get into as it requires training for three sports but it really isn't as insurmountable as it seems. For people considering doing one I would suggest the following. 1. Pick a short (sprint) race for you first and make your goal to end it with a smile on your face. Not worrying about performance will take most of the stress out of training and the race itself. 2. The amount of equipment available for triathletes is staggering and can be really expensive. Other than a good pair of running shoes and a pair of tri shorts, I wouldn't buy anything for a first race. For the bike use one that you have or borrow one from a friend. Buying one is a potentially expensive proposition for something you may not want to pursue and just about any bike will do. 3. Looking at some plans or the amount of training that others do can make you think you have to log a lot of training time but the reality is that you can accomplish a lot with just an hour a day of training. 4. A lot of people say swimming is the thing they are most worried about and I can certainly relate to that. If that is the case then spend as much time as you can in a pool. The goal isn't to use the added time for workouts but to just become more comfortable in water. Lastly, I am more than happy to answer questions and can be contacted via Twitter or on my blog.